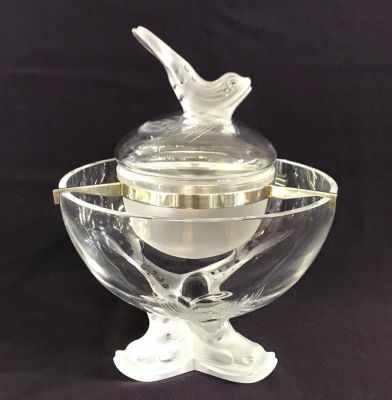 Lalique France Igor caviar dish. Designed by Rene Lalique’s granddaughter, Marie-Claude Lalique in 1969. She was the director/owner of Lalique from 1977 to 1994. The dolphin elements and the internal bowl are frosted and the rest of the surfaces are polished smooth. The metal frame is silver plate. 10” high, 7 3/4” diameter.